Discover beautiful azure blue topaz. This gorgeous pair of 9ct white gold heart shaped stud earrings are designed for effortless everyday chic with a touch of sparkle. 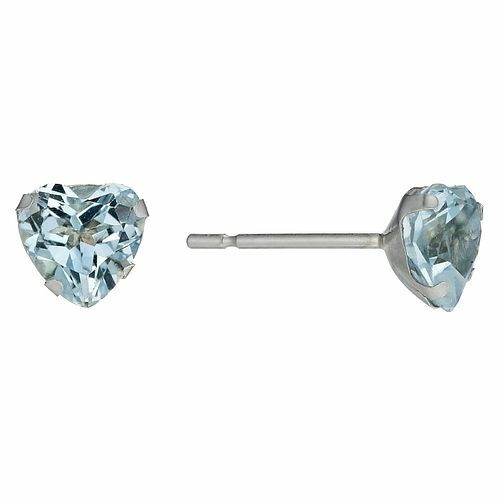 9ct White Gold Blue Topaz Heart Stud Earrings is rated 4.3 out of 5 by 13. Rated 5 out of 5 by Anonymous from pure class these are great and she loved them for her birthday. Rated 4 out of 5 by Anonymous from Beautiful little stud hearts I was bought these earrings as a birthday gift. They are beautiful little stud hearts. The colour is a subtle blue. Perfect for every day wear.